Here I go again with my matchy-matchy tendencies! 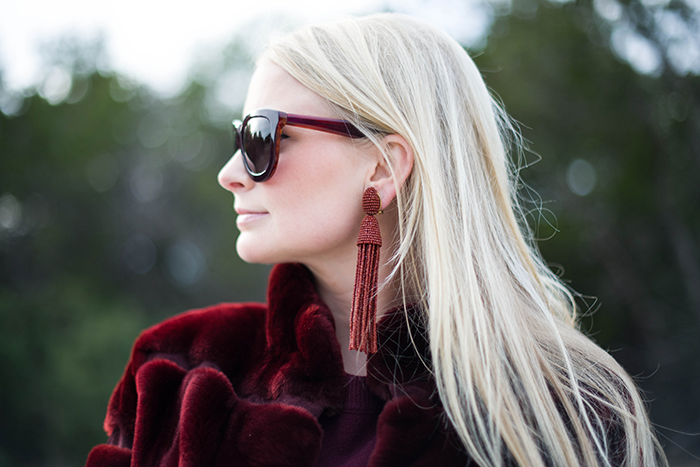 I borrowed this fluffy fur jacket from my sister when in Austin since it went so perfectly with my bordeaux J.Crew sweater – the combo looked great with jeans for a more casual look, but for this occasion I chose to continue the theme with another rich shade: cognac. I picked up this leather Phillip Lim skirt on sale at Nordstrom (it’s only available at FarFetch now) about a month ago and it looks great with everything. From white oxfords to oversized black sweaters, with heels and sneakers, it is just an essential in my closet now. It’s pitch perfect with my Margiela booties, right? This weekend I’m planning to celebrate a friend’s birthday and the Super Bowl on Sunday. What do you have planned? Check back tomorrow and Sunday for some great sale info and interior inspiration! This jacket is amazing, most of all I love your earrings. The outfit is perfection, LOVE IT! This outfit is both edgy and chic. But I’m in love with the skirt! What a great look, loving all the texture! Those earrings are amazing too! Such an interesting color combo, but I love it! Awesome booties as well! This is my favorite outfit of yours ever – the mix of colors & textures is so luxe and utterly gorgeous on you!! That jacket looks SO cozy! Love the matchy matchy, and these colors paired together. Wow! What a gorgeous combination. That shade of bordeaux is just insanely beautiful on you! I love this mix of colors! And those earrings! They’re amazing! Wow! Stunning! This look is so gorgeous, I love it all from head to toe. Looking amazing, pretty lady! Beautiful combo, one of my favorite looks of yours dear! Love the bordeaux with peanut butter. A great color block combo. Your nails look great! Love it all!! Amazing – great colors! Just got a pair of MM6 booties recently and they are SO comfortable. I can’t decide on my favorite piece. It’s a toss up between the earrings, jacket and skirt. They look great together but would be equally as stunning individually. This weekend, we’re moving in to our new house (i.e. : guest house until the main house is built). So, it’ll be a sweaty, stressful weekend, but I’m looking forward to cheering the Broncos to a victory on Sunday. Have a great weekend, Merritt! Ah I freakin love this. The color combination is so different but cool and that jacket is gorgeous! that skirt fits you perfectly!!! Bordeaux is a favorite color of mine – I love how you mixed it with the caramel color. I have similar skirt and you have give me some style inspiration for how to change up how I have been wearing it. The two colors look gorgeous paired together! I LOVE this outfit so much, I’m not even sure where to begin. The coat and skirt are both amazing. This color looks fantastic on you! Hope you have a great weekend. love this combination on you and that coat is so cute! These colors are absolutely stunning on you!